For the carrot cake, preheat the oven to 180C/350F/Gas 4. Line the base of a 23cm/9in round springform cake tin with re-usable non-stick silicone liner or baking parchment and grease the sides with olive oil. Toast the pine nuts by browning in a dry frying pan; the oven alone is not enough to scorch out the paleness. Set aside. Put the golden sultanas in a small saucepan with the rum, bring to the boil, then turn down and simmer for 3 minutes. Whisk in the vanilla extract and eggs and, when well whisked, fold in the ground almonds, nutmeg, grated carrots, golden sultanas (with any rum that clings to them) and, finally, the lemon zest and juice. 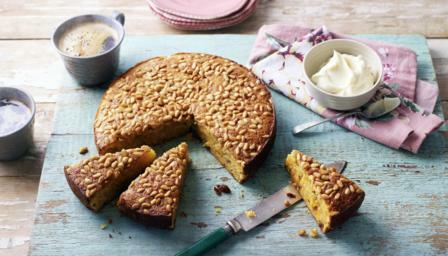 Sprinkle the toasted pine nuts over the cake and put it into the oven for 30–40 minutes, or until the top is risen and golden and a skewer inserted into the centre comes out sticky but more or less clean. For the mascarpone cream, mix the mascarpone with the icing sugar and rum. To serve, transfer the cake to a plate. Put the mascarpone cream in a bowl to spoon alongside the cake, for those who want.